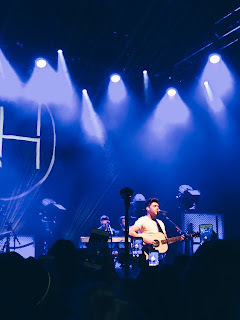 A couple of months ago I was lucky enough to get tickets to see Niall Horan on his ‘Flicker Sessions’ tour in London. 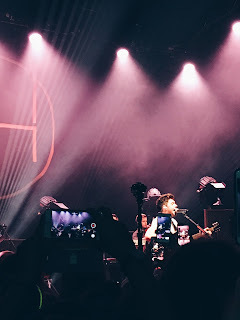 This was one of only 3 European dates on the whole tour, and with the venue a capacity of only 2,000 people I was completely shocked and so happy which I managed to get tickets! What made this show even more special was that it was the first time I was going to a concert with an internet friend who I’d never met before! Me and Maddie met on twitter only a few months ago but we have become close so quickly and decided on a particularly spontaneous moment to go to London to see Niall together. I know I certainly don’t regret the decision! On Thursday morning I headed out of the house shaking with a mixture of nerves and excitement and before long I was standing at the exit to the platform that Maddie was going to come out of when she got off her train. Turns out, it wasn’t the right exit and after about ten minutes we realised we were on opposite sides of the platform to each other. What a great start! After finding each other and having a quick lunch in Pret A Manger, we got on the train to London and couldn’t quite believe that this moment had finally arrived. We arrived in Shepherd’s Bush at around 3:30pm after a minor (read: major) trauma involving me losing my bag at Watford Junction train station – but that’s a story for another time – and headed to the venue to say hi to a few of our twitter friends before checking into our hotel. Finally at around 4pm we met up with everyone again outside the venue and hung around wondering whether to get into the normal queue or join the O2 priority queue which we were told would open once the people who had won M&G with Niall came out again. After a couple of hours waiting, hanging out with and meeting new friends, being shouted at numerous times by stupidly grumpy security guards and having to go back to Sainsbury’s to get plastic forks for our pasta, it was almost time to be let into the venue. I knew it was going to be a crazy scrap to get as near to the front as possible, but because we got there so late compared to most people I expected us to be near the back. We were in the O2 priority queue behind around 150 other people, and we started getting let in at the same time as the general queue. To our surprise we got in and were actually really close to the front, about 8 rows back! The venue was so small that anywhere in there would be a good spot, and it was really beautiful inside too. The support act, an Irish band called Picture This, came on at about 8pm and I actually really enjoyed their set! 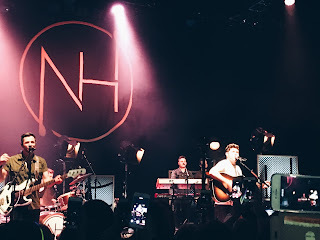 As I’ve said numerous times, I usually am really not bothered about the support act, but I really loved Picture This’s music and they were very good live singers and got the crowd pumped up for seeing Niall. Luckily it wasn’t too long a wait until Niall came on and opened with ‘The Tide’, a song that I had never heard before as it is from his unreleased solo album. Niall’s show was pretty unusual because, other than a few videos on twitter from the first concert in Dublin, none of us had heard his album yet. Niall explained that he wanted us fans to be able to hear the album first before it got released and I thought this was such a sweet, unique idea. 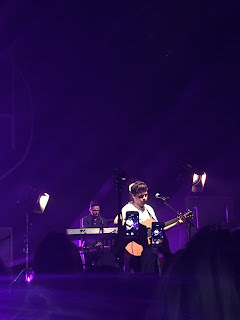 It was quite strange not being able to scream out the words to most of the songs, but it was also a refreshing experience to just be able to listen to Niall’s voice singing the songs without the screams of the crowd in the background. 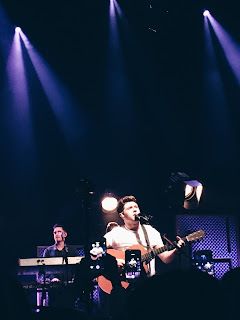 Nevertheless, the third song on the setlist was ‘This Town’, Niall’s first solo single and it definitely was one of the highlights of the show for me. Something about this song has always made me so emotional, and hearing Niall’s beautiful voice sing it live with all the lights in the crowd swaying along brought tears to my eyes, I will unashamedly admit. Another of my favourite songs was ‘Flicker’, the song that the album and tour is named after. Niall introduced it by saying that the song meant a lot to him and that it was the closest to his heart which is why he decided to name the album after it. As soon as he started singing it I could tell why. This one also gave me goosebumps and watching the video I took of a small part of the song makes me tear up, it sounds so beautiful and pure. 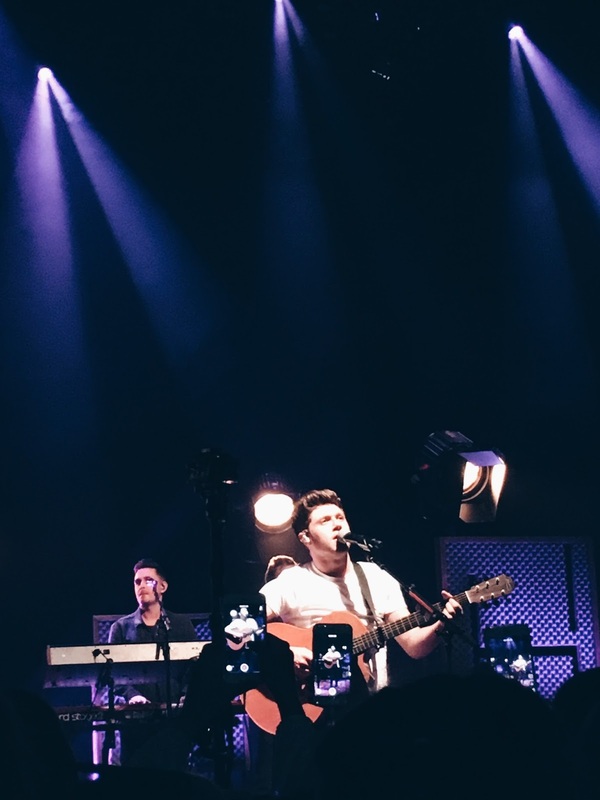 You could really hear every word Niall sang and his voice was so strong yet delicate, he hit every note perfectly and the fact that the crowd was almost silent just watching him sing and play guitar on that stage was a really special moment and I am so grateful I got to be a part of such an intimate show. 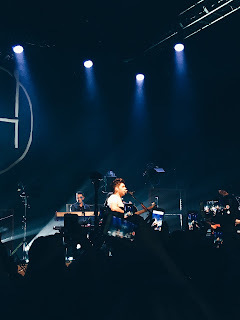 Amongst the slow emotional songs, Niall sang some upbeat ones such as ‘Mirrors’ and ‘On The Loose’ which got everyone jumping up and down having the time of their lives. But the definite highlight of the upbeat songs was ‘Slow Hands’, the second single from the album. I can’t even explain to you how amazing the atmosphere was during this song, I’ve never experienced anything like it. Everyone was jumping around with their arms in the air, singing along so loudly and it was honestly like a massive party, it was so incredible. 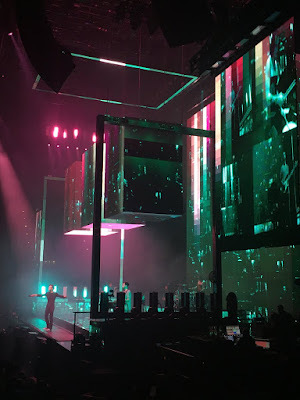 I really lost myself during this song, screaming out the words and jumping around having the time of my life – the epitome of what I love about concerts. Despite the entire show being amazing, there was one highlight that definitely tops all the others. This was when Niall sang a One Direction song that had never been sung live by the boys before, ‘Fool’s Gold’. Honestly, I’ve tried so hard to try to form a description of it in words. Nothing does it justice. As you all know by now I’m a huge One Direction fan and have been for almost 7 years so for Niall to sing one of the band’s songs at his first solo tour was extremely emotional for me. I’ve genuinely never heard a crowd sing along so loudly and the sound of everyone screaming out the words reverberated around the whole place as it was so small, you could hear every word. The passion that everyone sang with brought tears to my eyes and sent shivers down my spine. One Direction is the reason why we were all there, why Niall was there, and the bond between us will never be broken even though the boys are all doing their own things now. Overall I had one of the best nights of my life! 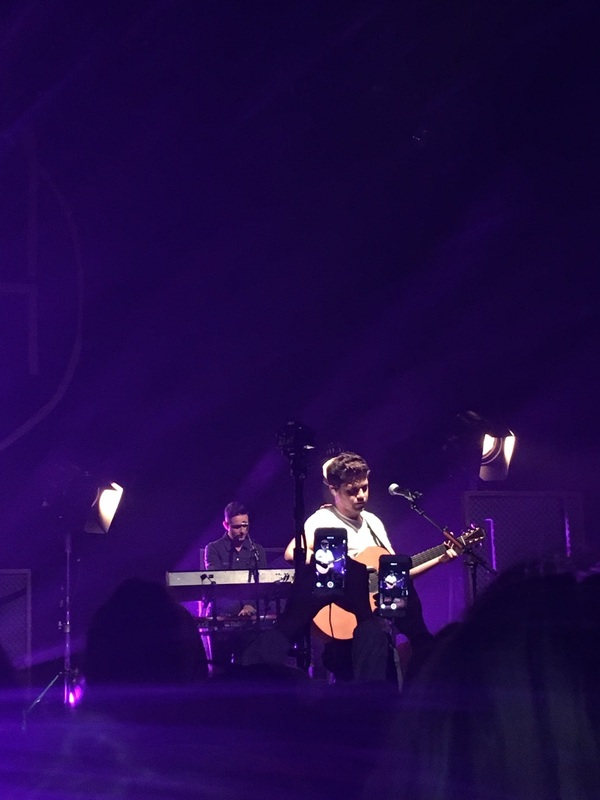 Seeing Niall up on the stage on his own was strange I’ll admit, but I enjoyed how chilled it was just him and his guitar playing us unreleased songs from his album. I loved that it was such an intimate venue and was so lucky with how close I managed to get. Niall’s vocals were absolutely amazing and I was blown away with how incredible his songs were, I can’t wait for the album knowing I got to hear the songs live first! Niall was also really interactive with the crowd which is one of my favourite things at a concert and he kept telling us how grateful he was to have us and thanking us for listening to his songs which was just so endearing and adorable. I feel so lucky to have had the chance to have such an amazing experience with some of my favourite people and to have met so many new and old friends for the first time. It was definitely a night I’ll never forget. 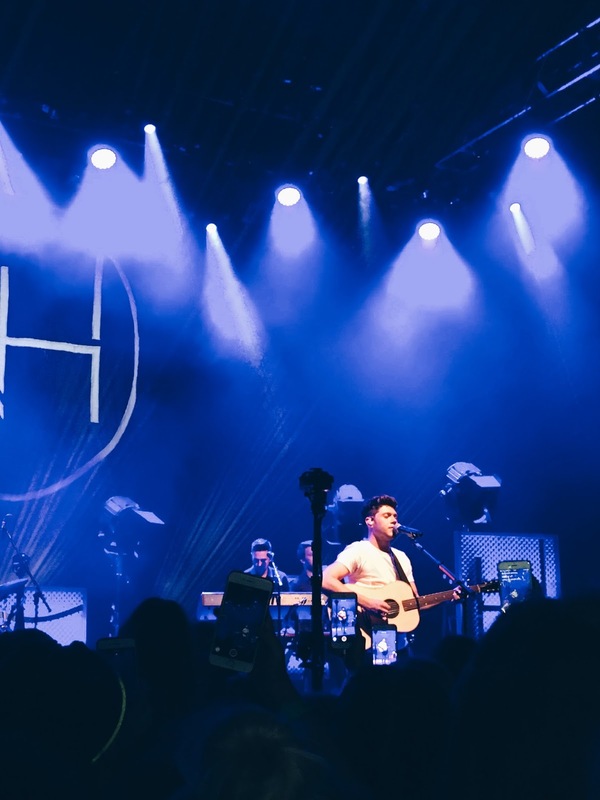 Have you seen Niall on his Flicker Sessions tour or are you hoping to see him on tour next year when he announces it? Let me know in the comments or just leave your thoughts on this post, I love hearing from you guys!